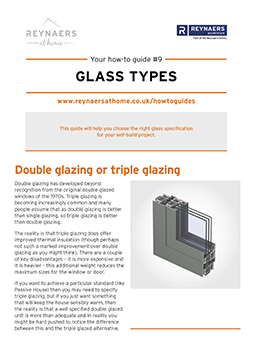 This guide will help you choose the right glass specification for your self-build project. 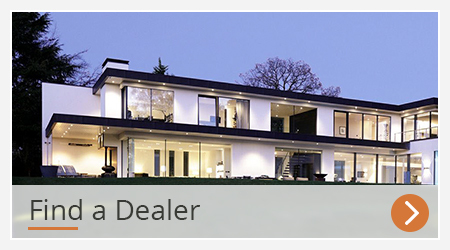 Double glazing has developed beyond recognition from the original double glazed windows of the 1970s. Triple glazing is becoming increasingly common and many people assume that as double glazing is better than single glazing, so triple glazing is better than double glazing. The reality is that triple glazing does offer improved thermal insulation (though perhaps not such a marked improvement over double glazing as you might think). There are a couple of key disadvantages – it is more expensive and it is heavier – this additional weight reduces the maximum sizes for the window or door. If you want to achieve a particular standard (like Passive House) then you may need to specify triple glazing, but if you just want something that will keep the house sensibly warm, then the reality is that a well specified double glazed unit is more than adequate and in reality you might be hard pushed to notice the difference between this and the triple glazed alternative. When replacing windows and doors the only reason for choosing single glazing is because you live in a listed building and have no other choice. Laminated glass comprises two sheets of glass sandwiched around a thin layer of (usually) polyvinyl butyral (PVB). This lamination process is done under heat and pressure, making the PVB act as a type of glue to stick the two sheets of glass together, creating one clear pane. Not only does laminated glass have a higher impact resistance, if one or both of the panes of glass do break, the pieces of glass remain stuck to the PVB interlayer. This makes the glass both safer and more secure. An intruder who is determined enough to keep hammering away at the glass will be able to make a hole in the PVB and may be able to get in eventually, but it will take a long time and all the hammering will create a lot of noise. Most intruders will give up when they realise the glass is laminated. Toughened glass is made in such a way that it is tougher (as the name suggests) and less likely to break than normal oat glass. It also is made in such a way that if it does break, it shatters into small relatively harmless pieces rather than long sharp shards of glass. The rules for the use of safety glass are a little complex and there are some exceptions, but the essence of these regulations is that any glass within 800mm of the floor, glass in doors and glass adjacent to doors up to 1.5m from the floor all needs to be specified as safety glass. Safety glass in this context is generally toughened glass or laminated glass. Increasing the gap between the panes is a good way of reducing the noise. This is limited by the window or door system – some can have a thicker sealed unit than others. Making one of the panes of glass thicker (perhaps 10mm) is also effective at reducing the noise. This adds to the weight, reducing the maximum size of the window or door, and can mean the glass has a deeper tint than a thinner pane would. See the section on low iron glass below. There are now some very clever acoustic laminates available which offer some excellent results. They are designed to both reflect the noise away from the building and also to absorb the noise in the acoustic interlayer. A combination of these three measures will give some very good noise reduction benefits. When you look at the cut edge of a standard pane of glass it is green. Most panes of glass are thin enough that you don’t really notice this green tint when looking out of the window. Low iron glass tends to be much clearer – if you look at low iron glass side-on you may still see a slight tint, but it is significantly less than on a standard pane. The clarity of low iron glass is useful in helping to maximise solar gain (the amount of energy that enters a room from the sun). This in turn is one of the measures used to classify a window or door’s thermal performance in the energy rating scheme (see separate guide on thermal performance). Low emissivity (or more commonly low-e) glass has been given an invisible coating that reflects the heat back into the house, reducing heat loss through the windows and doors. This technology was introduced to the mass market in the early 1990s as K glass. Low-e glass can be manufactured with a hard coat (like K glass) or more recently a soft coat. The soft coats generally give a better thermal performance than hard coats, and the original hard coats tended to have a slightly greyish tint to them, causing some householders to complain that it made their (nice, clean, white) net curtains look dirty! Smart glass or switchable glass is clever stuff. At the flick of a switch, the glass changes from being clear and transparent to being (usually fully) opaque. It is also possible to have smart glass that gradually becomes more or less tinted with changes to the electric current. There are few alternative technologies available to achieve this, but they tend to work in a similar way – the glass is opaque or tinted and then when a small electric current is passed through the glass it becomes clear. The glass is perfectly safe to touch and certainly has a wow-factor, but it is expensive to buy and it needs a power source. For a new build or an extension, getting power to the windows and doors is not generally a problem, but for the replacement windows and doors market it would mean a lot of redecorating. Self-cleaning glass sounds too good to be true… it has its place, but don’t expect miracles! This glass has a special coating on the outside of the pane that reacts with the sunshine to help break down the dirt. Then when it rains, the water is dispersed into sheets rather than droplets, and this washes the dirt away. The most useful application for this glass is on a conservatory roof, though even there it may be necessary to hose it down from time to time. 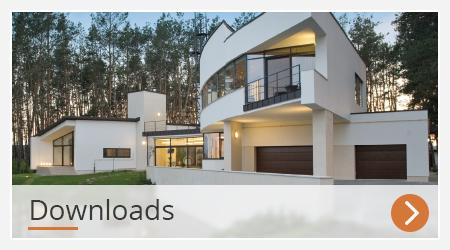 When it comes to windows and doors, it is not so effective. Self cleaning glass needs the rain to wash the dirt away, and unless the wind is regularly blowing some heavy rain in the right direction, the dirt will not be properly washed away. The self-cleaning coating is also quite delicate, so if you do choose this option, it is worth remembering to follow the cleaning instructions if you need to clean the glass by hand once in a while. The very nature of glass means there will always be some slight imperfections if you look closely enough in the right (or wrong) light. The Glass and Glazing Federation publishes some industry guidelines for visual standards detailing what is acceptable and what is not. The leaflet is called ‘Quality of vision – double glazing’ and can be found in the Downloads section of the GGF website.